If you've gone outside this past week in Southern California or turned on the news from another location, the storms in SoCal are pretty outrageous, at least for us Californians who are cold if it gets below 70 degrees. So what does the rain mean to us Californians? Well, it means you're staying in tonight and probably this weekend. See, us Californians, we are like cats. We do not like any uninvited water on us in any form, unless of course it is a nice dip in the pacific ocean after a rigorous tanning session. So here you are, staying in tonight...and this weekend. At this point you have studied and read Trader Joe's List Top 10 Wines in addition to overhearing the weather man utter "a wet weekend". That being said, you decide picking up the top 8 wines complemented by a few netflix deliveries sounds like a fun, dry weekend. Oh it is! But come Sunday morning, you realize drinking 3-4 bottles Saturday night leaves you with an aching headache and an overall hangover. Rather than taking a few IB profin please perform the following: 1) boil 2 cups of water. 2) Toss in that miso soup packet. 3) Drink. 4) smile, because within 20 minutes you are feeling 1000 times better. No joke, this soup is a quick fix and at only 90 calories a packet, you are feeling less guilty about that late night pizza order too. Call me skinny, but miso soup makes mesohappy. 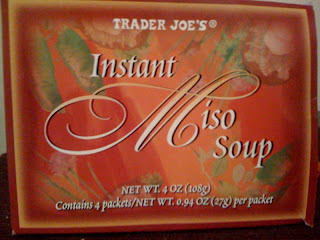 Trader Joe's Instant Miso Sop is the best!!!!!! Why was it discontinued? A store clerk said that the manufacturer didn't want to make it anymore. A bit to hard to believe if the item was so popular. I'm glad I'm not the only one who is pissed off over the Instant Miso Soup being discontinued. I love that stuff! I'm gonna protest! Anyone found anything NEAR comparable? If so, please share! First, I was devastated that you discontinued the "Melba Rounds". Now you discontinue the best miso soup ever. so sad. oh yeah, you also discontinued your sweet and sour mustard. life just got considerably less awesome.